Twins Jadon and Anias McDonald before they were successfully separated in a surgery at the Childrens Hospital at Montefiore that took more than 20 hours. Nicole McDonald has reluctantly documented her family's experience as her twin sons who were attached at the head faced their most difficult surgery yet last week. But if supporters of her family read anything she hopes, it's her message to them and the doctors who saved her children. In a lengthy and emotional Facebook update on Saturday, the Illinois mother shared that as she and her husband "emerged from the depths of the hospital" in New York City last week, they were forced to face the fact that their family's private battle has quickly become a national story. "For those of you who don't know us, it might be interesting to note that we do not have TV or Internet access at home," she wrote. "We don't get to watch the news on a regular basis and we have literally spent the last 36 hours at the boys' bedside or waiting for updates from the doctors in the Caregiver Support Center at Montefiore." McDonald's 13-month old sons, Jadon and Anias, were separated following 16 hours of surgery at Montefiore Medical Center. McDonald noted that at first, she didn't want to take her family's unique situation public, but agreed because they wanted to help show the medical miracle that would soon separate her sons. "Our biggest desire was to show how brilliant the team at Montefiore has been and to give the hospital the credit it deserves," she wrote. "The real heroes of this story are the people who have put countless hours, days and months into the success of today." McDonald had been sharing updates on the surgery as the boys returned to their room one by one. Hours later, McDonald wrote that the brothers had been "finally reunited." "How surreal. I now realize that I always saw you as separate because seeing you like this is really nothing different to me," McDonald wrote. "When I stand at your bedside, Jadon, it's almost as if Anias is still there. Anias, when I leaned over you I protected my hair from Jadon. But the view is still the same. This is how I always saw you. I love you so much. Now it's time to step forward into the new chapter of our life. I'm ready to fight and I know you are too." McDonald earlier described the atmosphere as "one of celebration mixed with uncertainty." She says Jadon did better than Anias during the procedure, adding that doctors predict he may not be able to move part of his body at first. "When they told me they were wheeling Jadon up first, it took me a second to comprehend," she wrote. "I actually asked why they rearranged the room because I hadn't really internalized the idea that there would be 2 beds in here." McDonald and her husband first found out they were having twins during a routine ultrasound when she was 17 weeks pregnant. But hours after learning the big news, the couple was called back for a repeat ultrasound, a call she said is "every pregnant mother's nightmare." "It was on that day, in that dark room, that our whole life changed," McDonald wrote in a GoFundMe page for the family. "I was informed that I was pregnant with craniopagus twins, which in normal language means twins who are joined at the head. I was given the option on many occasions to abort my precious babies. I kindly declined. I had heard their heart beats...they spent their life listening to mine. It was my job as their mother to give them life and I decided that I would give everything up, if need be, to do so. Miracles happen...and there is one (really, two :)) unfolding before our very eyes." McDonald went into labor on Sept. 9, 2015 and an emergency c-section was performed at Rush University Medical Center. The boys were named Jadon and Anias. While the babies started having some health problems shortly after birth, things quickly "went downhill" for the McDonald family. "Anias started having trouble breathing," McDonald wrote. "Because of the way he was positioned in my belly, his chin was against his chest and his jaw couldn't grow. His airway was also constricted. As he required more oxygen for day to day life, his breathing got worse and worse, until eventually he was back on oxygen." 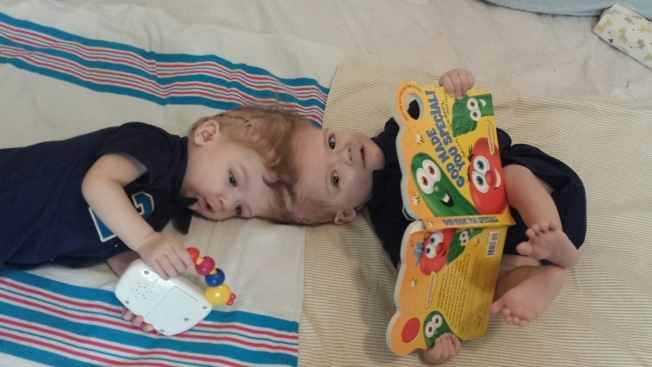 Months later, the couple met with a specialist in hopes of successfully separating the twins. Fast forward to October, the babies have undergone their final surgery, but their most difficult. The family's GoFundMe page had raised $161,161 as of Friday, exceeding their goal of $100,000 to aid with the babies' medical care. McDonald thanked those who helped her family during the trying time, saying "each and every one of you is a hero in your own way." "The people who literally lift us up and carry us when we feel like we just can't take another step. We are so blessed to have so much support in our corner," she wrote. Most recently, McDonald said the boys are stable, but "there are some things happening that I can't really find the words to explain or allow myself to dwell on." "Every thing changes from hour to hour and we just have to remember that the brain responds in crazy ways when it's been cut through," she wrote. "We still cannot hold the boys because they are intubated so we sit at their bedside and hold their hands, give them massages and kiss their faces. When I have a better understanding of their actual status, I will do my best to update. Thank you so much for your heartfelt support."